"Walk hand in hand with me through all eternity/ Have faith, believe in me, give me your hand/ Love is a symphony of perfect harmony/ When lovers such as we walk hand in hand.. 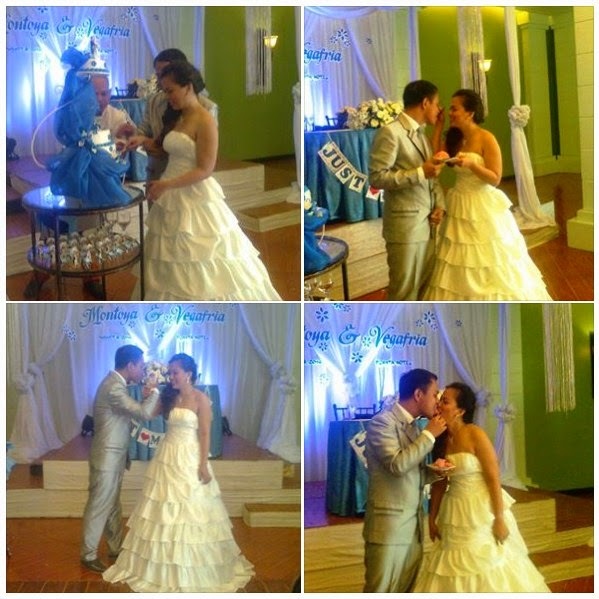 This is our DESTINY..."
There goes the popular love song that served as the background music while Edjie Montoya and Narlyn Vegafria walk down the aisle to exchange I do's at the San Isidro Labrador Parish church, Brgy. Tangub, Bacolod City late in the afternoon of Friday, August 8, 2014. Reverend Father Mitchelle Guadalupe who solemnized the marriage inspired the would-be couple of his practical bits of advice in making their married life enjoyable, enduring, and avoiding possible break-up. Even the whole congregation and the principal sponsors did absorb the said down-to-earth counsel. 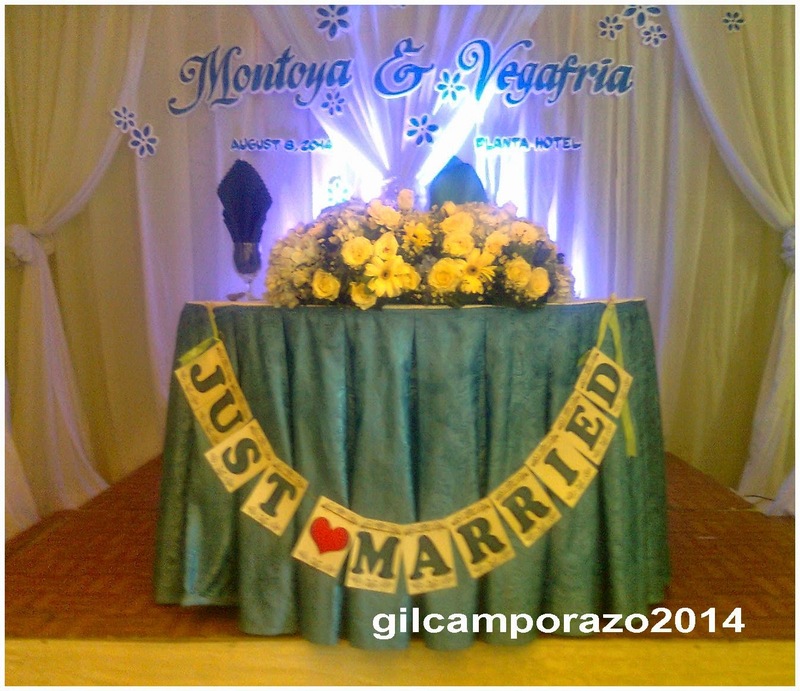 After a sumptuous wedding dinner at La Planta Hotel, Bacolod, the couple took center at the reception hall to dance. While they're dancing concerned and thoughtful sponsors, relatives and friends gave some pieces of monetary gifts in various denominations by pinning them to the skirt of the bride and to the sleeves of the groom. The nuptial ceremonial toss of wine, slicing of the wedding cake and feeding each other, and other after-wedding games ensued and everyone enjoyed. To the newly-wed, as one of the principal sponsors, I would advise both of you "to love one another and do not love another one..."
By the way, the groom was my grade six pupil in 1999 at La Carlota South Elem. School 1. He's a good, diligent pupil. He could be best trusted in any school work and assignment given me. When you say forever I believe..."
Edjie is the son of Edgardo and Gilda Montoya and Nalryn is the daughter of Edgar and Amalia Vegafria. Congratz and best wishes to both of you, Ijado and Ijada! Joel Sombito, Danny Tubianosa, Dexter Yap, Jayrus De Los Santos, Gary Apachica, John Ganza, Vicente Baliguat, David Baga, Gilbor Camporazo, Jerry Tingson, Roberto Impanado, Serafin Pahinlason, Roneo Valenzuela, Ismael Salvacion. "Who wants another upgrade? Be ready to get new soft for your Macbook"?. A motivating discussion is worth comment. I think that you should publish more about this subject matter, it might not be a taboo matter but generally folks don't talk about such subjects.